Books are always able to help us see outside ourselves and our real situation. We could grasp much bigger idea and new concepts especially from sci-fi books. Because these fiction books are built upon the future human beings has always been heading to. With the prompt of audiobooks, fiction audiobooks would change how we perceive the future world created by sci-fi writers. In this post, we would like to recommend 10 best fiction audiobooks to you for your long flight or train journey. 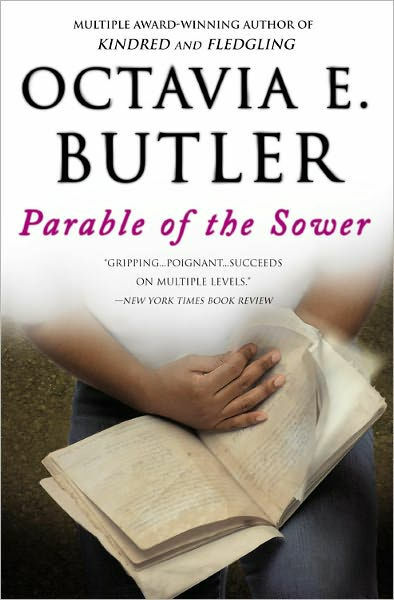 The below are the 10 best fiction audiobooks we’ve collected for you. Most of these fiction audiobooks are available for downloading on iTunes and Amazon store. Check them below. 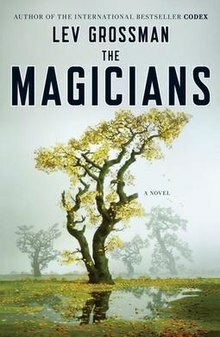 The Magicians is a new adult fantasy novel by the American author Lev Grossman, published in 2009 by Viking Press. 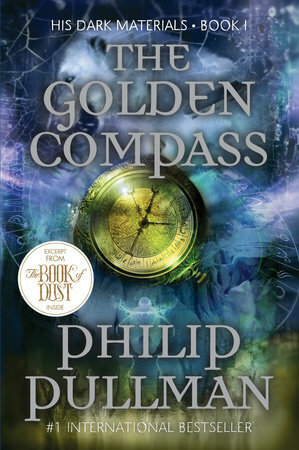 It tells the story of Quentin Coldwater, a young man who discovers and attends a secret college of magic in New York. 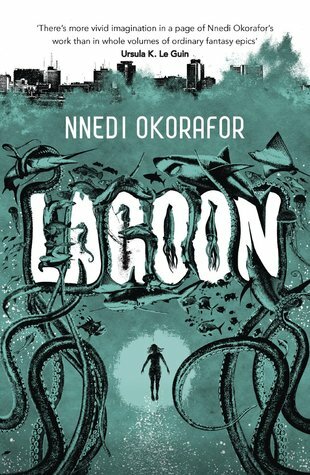 The novel received critical acclaim, and was followed by The Magician King in 2011 and 2014’s The Magician’s Land. 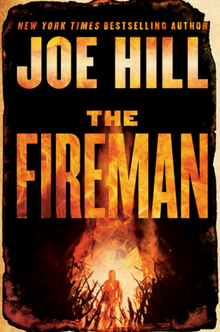 The novels have been adapted as a television series that currently airs on Syfy. Lyra Belaqua is content to run wild among the scholars of Jordan College, with her daemon familiar Pantalaimon always by her side. But the arrival of her fearsome uncle, Lord Asriel, draws her to the heart of a terrible struggle–a struggle born of Gobblers and stolen children, witch clans and armored bears. And as she hurtles toward danger in the cold, far North, young Lyra never suspects the shocking truth: She alone is destined to win, or to lose, this more-than-mortal battle. 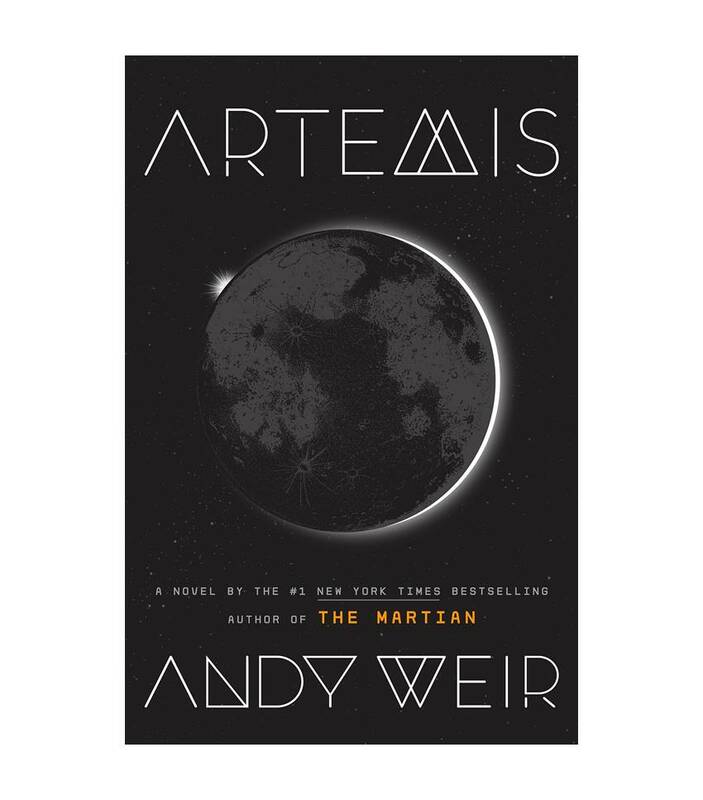 Set in the lone city on the moon, Andy Weir’s Artemis follows 26-year-old Jazz Bashara as she’s drawn into a smuggling scheme and finds herself in over her head. 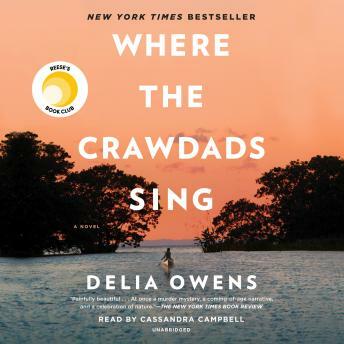 Performed by Rosario Dawson, who “clearly brings her experience as an actress who has portrayed so many roles in the sci-fi, fantasy, and action genres” to the role, according to an editor at Audible, listeners get a taste of the feisty heroine for who she is. His Majesty’s Dragon is the first of a planned trilogy (The Throne of Jade and Black Powder War will appear in 2006). Amply praised by SF writers, this original alternate-reality historical SF novel stands fully on its own. 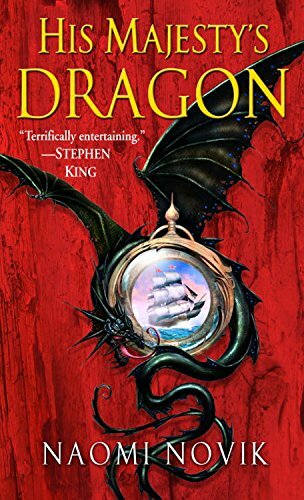 Against the convincing backdrop of the Napoleonic wars, Novik limns fantastical battle scenes, creates emotionally astute and appealing characters (dragon included), and provides unique insight into dragons, their abilities, and their breeding combinations. At center stage lies Temeraire’s and Laurence’s strong bond, one critics hope Novik will explore in future novels. His Majesty’s Dragon, notes Fantasy Bookspot, is more than a “worthy choice for those looking for a new series to indulge yourself in for the new year.” But you’ll have to wait: it won’t be released until the end of March. 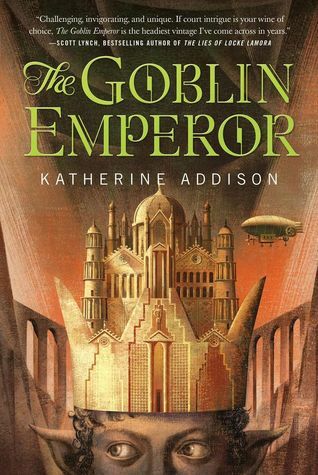 The youngest, half-goblin son of the Emperor has lived his entire life in exile, distant from the Imperial Court and the deadly intrigue that suffuses it. 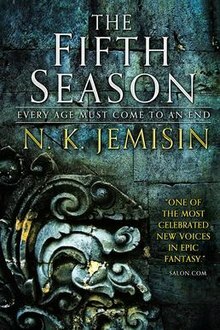 But when his father and three sons in line for the throne are killed in an “accident,” he has no choice but to take his place as the only surviving rightful heir. Entirely unschooled in the art of court politics, he has no friends, no advisors, and the sure knowledge that whoever assassinated his father and brothers could make an attempt on his life at any moment. In a prologue, an extraordinarily powerful orogene discusses the sad state of the world and laments the oppression of his race. He then uses his enormous power to fracture the entire continent along its length, threatening to cause the worst Fifth Season in recorded history. The story then follows three female orogenes across the Stillness from different time periods: Essun, Damaya, and Syenite. Then the question might become: how to download fiction audiobooks? Actually, it’s very simple. No matter you’re using iPhone or Android smartphone, you could get audiobook reading app on your phone or device. 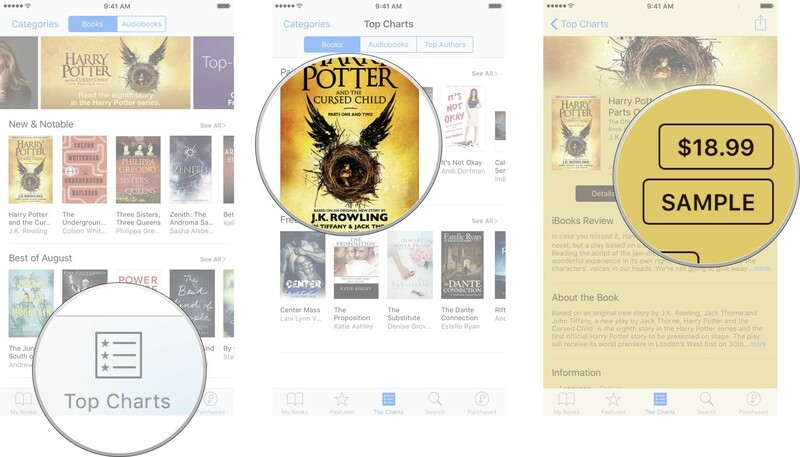 Here we would like to take downloading audiobooks on iPhone as an example to show you how to download fiction audiobooks. The below steps would show you how to download fiction audiobooks on iPhone. 1. Launch the iBook app. 2. Tap Featured or Top Charts at the bottom and then Audiobooks at the top. 3. Tab the title of the audibook you wish to download. 4. Tap the price and tap BUY AUDIOBOOK. 5. When you have finished the purchase, go to Purchased tab at the bottom. 6. Tap Audiobooks and then All Audiobooks or Recent Purchases. 7. Tap the cloud icon beside the audiobook to download. When the downloading finishes, you could then freely listen to the audiobooks on your iPhone’s iBook app. Actually, there are also free audiobooks on iBook store. Sometimes you may want to share your purchased fiction audiobooks with friends. However, it’s known to all that most audiobooks from book stores like iTunes and Amazon are DRM protected, which restricts you from sharing these audiobooks. What could you do to share fiction audiobooks with friends? You could turn to Leawo Prof. DRM to remove the DRM protection and convert DRM protected aubiodooks to MP3 files for unlimited sharing. Leawo Prof. DRM is able to remove DRM from iTunes M4B audiobook and Audible AA/AAX audiobook, and then convert M4B, AA, and AAX to MP3 for freely playback on various media players and mobile devices. 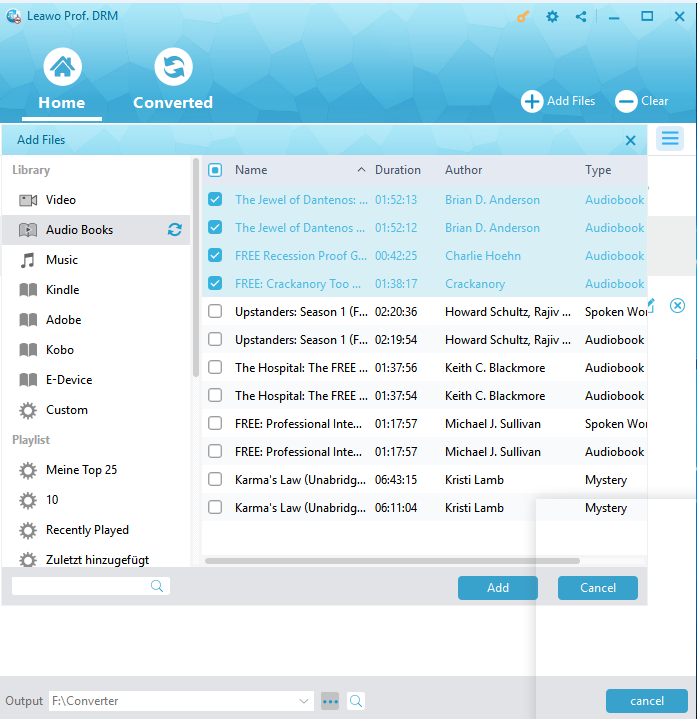 Download and install Leawo Prof. DRM on your computer and then follow the below steps to learn how to convert DRM audiobooks for sharing. After launching Leawo Prof. DRM, click the “Add File” button to browse and add audiobooks you’ve downloaded on your iTunes to Leawo Prof. DRM. After importing the audiobooks, you can view the files under the category “Audiobooks”. And then you can choose an audiobook file and click the “Edit” button to freely choose Channels, Sampling Rates and Bit Rates for keeping in the output MP3 audio file. Now, you need to move mouse to the bottom and then open the “Output” box to choose output directory. Finally, click the bottom right “Convert” button to start converting audiobooks to MP3. The DRM removal works in the background. When the conversion finishes, you could then freely transfer the DRM protected audiobooks to any audiobook reader or device as you like.